“All eLearning must be engaging.” “All eLearning must be interactive.” Of course I agree with these industry mantras. But interactivity for its own sake does not make a successful custom eLearning. 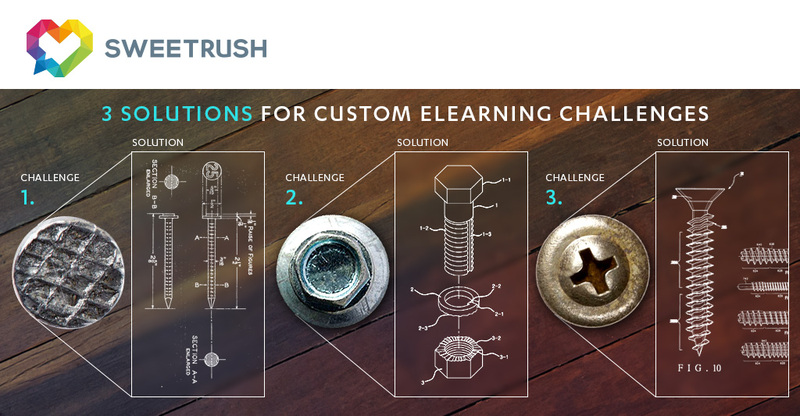 Each project comes with its own set of challenges—the trick to creating truly successful custom eLearning is finding a way to address these unique challenges in creative ways in your solution. Challenge #1: People think they know this content (but they don’t). Solution #1: OK, smarty pants, prove it! Throw the learner into a situation where they are called on to handle a real-life scenario. If they can’t do it—you now have their attention! Challenge #2: The classroom version of this training had collaboration and competition, and those items were identified as key success factors. Solution #2: Build it in! Asynchronous eLearning can still incorporate competition through leaderboards and social tools. If collaboration is key, build in synchronous, collaborative sharing events throughout the learning process, either through a social tool or a virtual meeting platform. When converting instructor-led training to custom eLearning, get creative in your approach in order to maintain the key components that make the learning successful. Challenge #3: No one wants to take this compliance training! They’re not going to pay attention anyway. Solution #3: This is my favorite challenge! Learners come to this type of training with a preconceived notion of what the experience will be—this is our chance to surprise them. One idea a colleague had recently that I loved was to start the training with a montage of old photos that you would expect to see in a compliance video and then abruptly STOP the sequence and unveil a modern, 3-D environment with animated avatars and humor. This abrupt visual shift tells the learner that this isn’t your usual boring compliance training. And now you have their attention! So, my tip: If you approach each custom eLearning project as a new, unique challenge to be solved, each solution will be tailored to, and targeted to address, that specific challenge. The interactivity and engagement will surely follow.